Who likes to try new pickups? Show of hands? Of course you do! It can be one of the more cost effective ways to try a new tone. Now… who likes to solder? Yep. I’m there with you. And I have an awesome soldering station that I literally enjoy firing up. But, come on… breaking out the solder can get old. Of course, what about players that don’t know or would not care to solder? Nothing wrong with that. Many houses are still standing from people that know their limitations with a soldering iron. LOL! It’s a good thing we have some solderless options to choose from! For example, our pals at Mojotone have a hearty selection of solderless harnesses to choose from. You’re covered for multiple Tele and Les Paul and SG and Strat styles. And it’s one of the Strat styles we are looking at today! 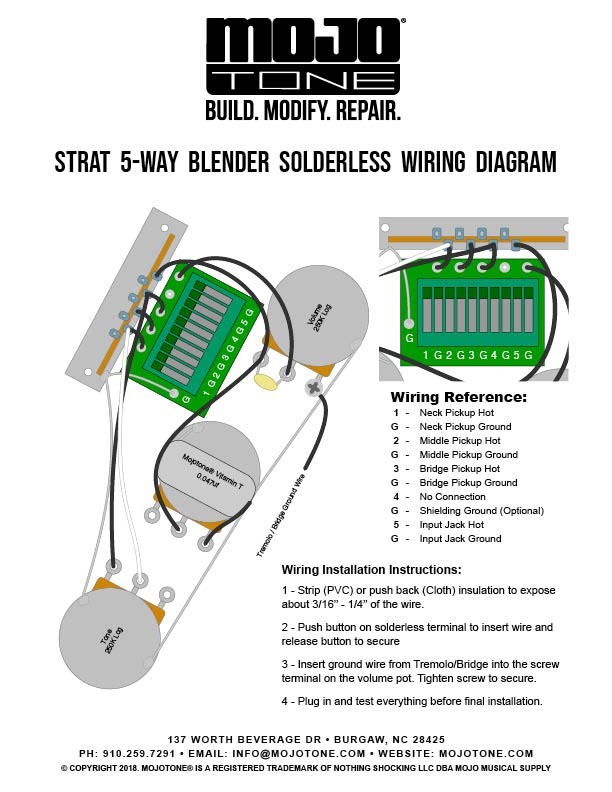 The Solderless Strat Blender Harness is a very simple direct drop-in to your existing pickguard. Pull it all out of there! 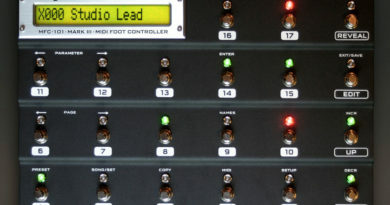 You don’t need the 5-way switch or even the output jack. New ones are included. The only wiring you really need to hold on to is your ground wire. If you don’t even have a soldering iron, don’t sweat it. Just use your wire cutter! See… totally solderless. 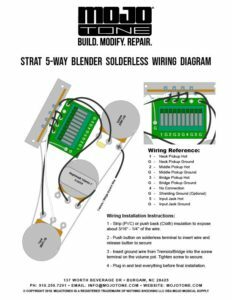 For this application, I’m putting the Solderless Strat Blender Harness in with a new set of Mojotone ’59 Clone Singlecoil pickups (review on those coming soon!). 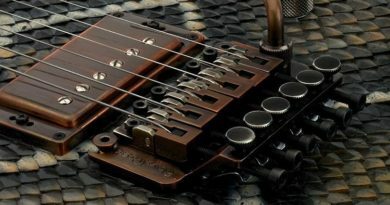 These pickups have push-back cloth insulation, so wire strippers really aren’t even necessary. 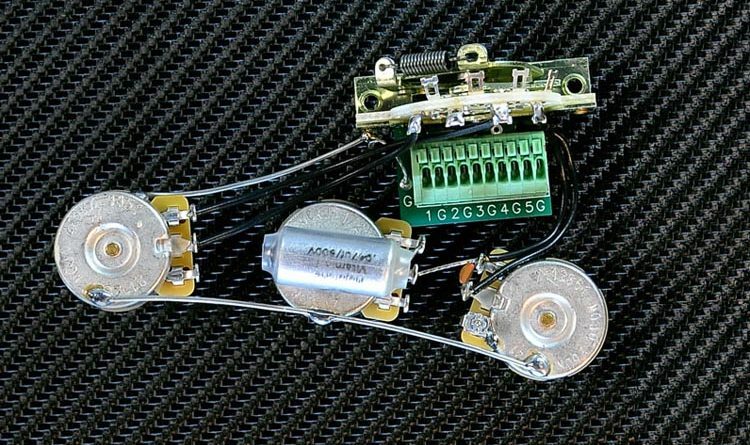 Side note: the output jack that comes with the harness is pre-wired with the same type of push-back wiring. At this point, it is as simple as putting the ends of the wires in to the assigned terminal connection at the 5-way switch. The terminal is wired for ground, so your pickup’s ground wires go in there too. That makes for a bit less spaghetti in the cavity. HaHa! How about your shiny new Switchcraft output jack? Those leads go to that same terminal as well. Let’s not forget your ground wire from the bridge! It has it’s own home via a grounding terminal on the volume pot. 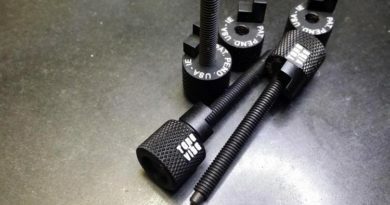 Just tighten down a screw. And still no soldering. If you do have your shielding grounded, the terminal at the 5-way has a optional slot for that as well. It’s all super simple and very clean. The only thing you’ll miss is the smell of solder stuck in your nostrils for the rest of the day! LOL! That should give you a solid idea of what’s going on with the Blender control options. Tons of tone to choose from. Definitely give this a try. I installed this harness in my American Standard Strat without a hitch. If you don’t solder or aren’t in the mood to be a fire hazard (HaHa! ), the Mojotone Solderless Blender Harness is meant for you.